The Gift Machine may have moved to California, but they are nothing short of a Pacific Northwest band. Listening to their music will take you immediately to the foggy forests off the Puget Sound coast. Through trails of dense foliage alongside crawling streams, surrounded by the sweet smell of decomposition, moisture lingering in the air. Dave Matthies, lead singer and guitarist for the band, started The Gift Machine as a solo project and has been present for all of the many transitions since those Anacortes beginnings, which stretch back to 1999. Many of the first songs he wrote came to him while wandering around in the Pacific Northwest woods, he said. And this is reflected in the melodic sounds of The Gift Machine’s earliest music, noteworthy for shadowy lyrics and angsty rainy day power pop rhythms. Through the early 2000s, The Gift Machine saw many different members, with the line up rotating frequently as musicians came and went. But Matthies has remained. Deep into the Anacortes music scene, he ran what was the Department of Safety, a now defunct recording studio and venue, worked on the annual What the Heck Fest, and also was one of two running KNW-YR-OWN records. Fast forward to 2017, and The Gift Machine is a simple trio based in North County San Diego. Matthies, his wife, Andrea Gruber Matthies, who has been singing and playing drums in the band for a decade, and Alanna Cassidy, who began six months ago as a keyboardist and has since taken on the bass guitar. If you’re thinking what I was thinking, yes, keeping a band alive for nearly two decades is quite a feat, especially when the arena has become no less crowded. But Matthies has an approach that promises longevity. Sure, The Gift Machine has done the country-wide touring, slept on the couches, made the CMJ Top 200 Chart, the whole bit. But Matthies has kept The Gift Machine as more of a passion than a way to make a living. And this has worked out well. His secret? Remaining collaborative and open to opportunity. Growing up and spending much of his time around other musicians, Davies understands the importance of working with others while striving for success, he said. With six albums, two EP’s, and many compilations under their belt, The Gift Machine perseveres. Currently, they are working on a new record due next year. 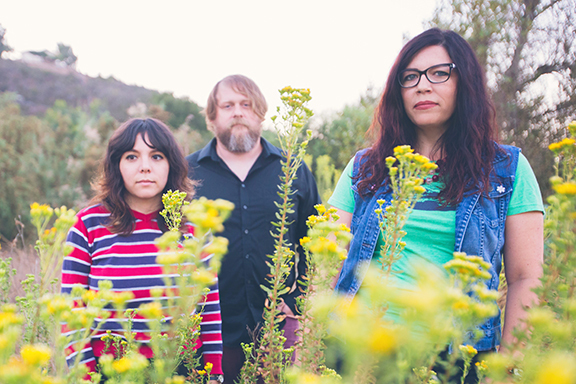 They will visit The Shakedown Friday, November 3, with a new 7-inch record in tow, and look forward to other small touring adventures out of San Diego and to audiences up and down the west coast. All of their work is self-produced by Matthies, who is the first to admit he is his toughest critic. Bellingham can look forward to a sound so indicative of the region – a moody, yet comfortable blend of energetic melody and vocal harmonies only lovers can create. After All, this is a band whose sound was born in the Pacific Northwest and remains true to its roots, no matter how near or far. Catch The Gift Machine at The Shakedown on Nov. 3 with SiLM and The Solvents. Follow their Facebook page for updates.